Fifa presidential hopeful David Ginola wants the men's and women's football World Cups to be staged together. The tournaments are currently hosted by different countries in different years. However the 47-year-old Frenchman wants "one global spectacular" that he believes will take the World Cup and women's football "to new heights". The former Tottenham winger is being paid £250,000 by a bookmaker to run for the top job held by Sepp Blatter at world football's governing body. 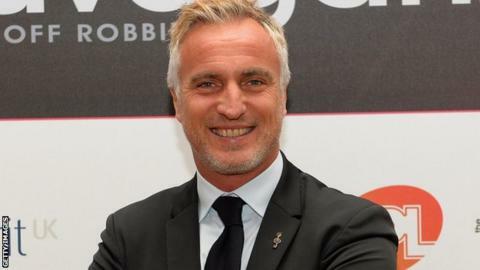 To be eligible for any election, Ginola would need the support of five football associations and must show active involvement in football for two of the past five years. Ginola told BBC Radio 5 live: "We're talking about equality because we want women to be treated as well as the men. "We want the women's World Cup to be organised and played right after the men's World Cup. "For example, it would have been in Brazil using the structure of the men's World Cup. It would be interesting to see how we can set this up." The 2015 Women's World Cup gets under way in Canada on 6 June, almost one year after the men's tournament took place in Brazil. As well as combining men's and women's World Cups, Ginola says he is determined to "restore trust among people towards Fifa". He plans to announce a policy a day in the lead up to the Fifa presidency nominations deadline on 29 January. Fifa vice-president Prince Ali Bin Al Hussein and former diplomat Jerome Champagne, who joined Fifa in 1999, are the other candidates to announce they will stand. Blatter, 78, has been Fifa president since 1998 and is seeking a fifth term in office.